Studio Canal’s Vintage Classic series brings us yet another treat with this lovingly restored edition of “Scott of the Antarctic”. Jack Cardiff’s cinematography hardly needs my endorsement but the painstaking restoration work by the team at Pinewood Studios really shows. The image is pin-sharp with none of that slight fringing we’re accustomed to seeing in unrestored early Technicolor films, and just makes me wish I had a bigger TV. The film makes good use of stock footage, locations, and inventive studio filming to portray the Antarctic as vast, desolate and hostile. There are references in the scenes to Herbert Ponting’s actual photographs from the expedition, notably the famous ‘ice grotto’ image – a teardrop-shaped ice cave with the ship, the ‘Terra Nova’, at sea in the background, and Scott working at his desk in the headquarters hut. It’s a straightforward, uncritical account of Scott’s last polar voyage, with John Mills a natural choice for the lead, giving an easy, natural portrayal of Scott as both affable and commanding. Harold Warrender as Dr Edward Wilson and Derek Bond as Oates are both quietly heroic in the best British tradition. Diana Churchill portrays Kathleen Scott, quite credibly, as the sort of formidable wife who, although beautiful and charming, is tough enough to be only slightly less frightening than a trip to the South Pole. If the film has a fault at all it’s perhaps that the whole thing seems a bit cosy and chummy, like a boy’s school outing, perhaps a little toned down from the tensions that must really have existed on the expedition, even if the honour code of the time kept them from being openly expressed. But then that’s only in keeping with the age in which this film was made – closer to Scott’s own time than our own – in which it would still have seemed somewhat improper to include the second half of the toast the men drink at the midwinter’s party (“Sweethearts and wives – may they never meet!”). Also of its time is the casting, which gives the impression that everyone was middle-aged and middle class in those days. Reginald Beckwith as Bowers is supposed so be 26, but he’s 40 if he’s a day, while James Robertson Justice is a very ‘RP’ Welshman . 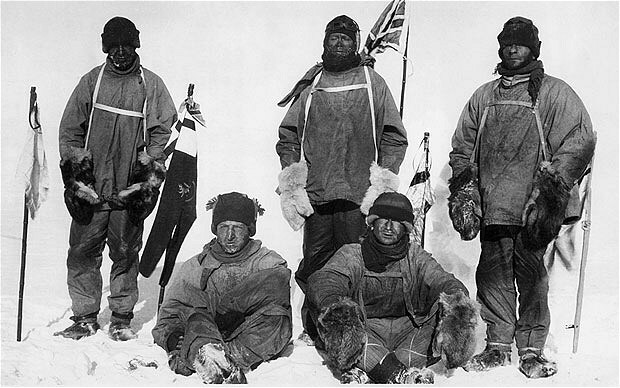 Views differ as to how responsible Scott was for the tragic end to his expedition, and the film makes no attempt to judge or analyse, except to show his men’s surprise when he decides to take a team of five to the pole instead of four. The 1985 TV series ‘The Last Place on Earth, based on Roland Huntford’s iconoclastic biography, is far more critical – but Huntford’s research is comprehensively dismissed by Sir Ranulph Fiennes in an interview he gives in the extras. However this is all scarcely relevant because in the end this is neither a critique, nor a character study of Scott – it’s a tribute, plain and simple, and there’s nothing wrong with that. Extras are well chosen. We get John Mills’s home movie footage from the location shooting in Switzerland, some stills, a brief doc about the restoration (in case we thought it was easy!) and interviews with Sir Andrew Davis, who gives a warm appreciation of Vaughan Williams’s music, and Jack Cardiff – which together with the stills shows what an incredibly small space the studio shots were filmed in. The magic of cinema, indeed. My favourite, though, is the interview with Fiennes, who brings the authority of his own experience and recent research to conclude that Scott’s achievement is, if anything, greater than he has ever been given credit for. That being the case, this film should stand as the definitive dramatisation of his last expedition. Scott of the Antarctic is out now on Blu-ray and DVD.